CHIANG MAI, Thailand, 2018-Jan-29 — /Travel PR News/ — The Pacific Asia Travel Association (PATA) is pleased to announce that the PATA Destination Marketing Forum 2018 (PDMF 2018) will be held in Khon Kaen, Thailand from November 28-30. The event, formerly known as the PATA New Tourism Frontiers Forum, will be held under the theme “Growth with Goals” and is generously hosted by the Thailand Convention & Exhibition Bureau (TCEB) and the Tourism Authority of Thailand (TAT). 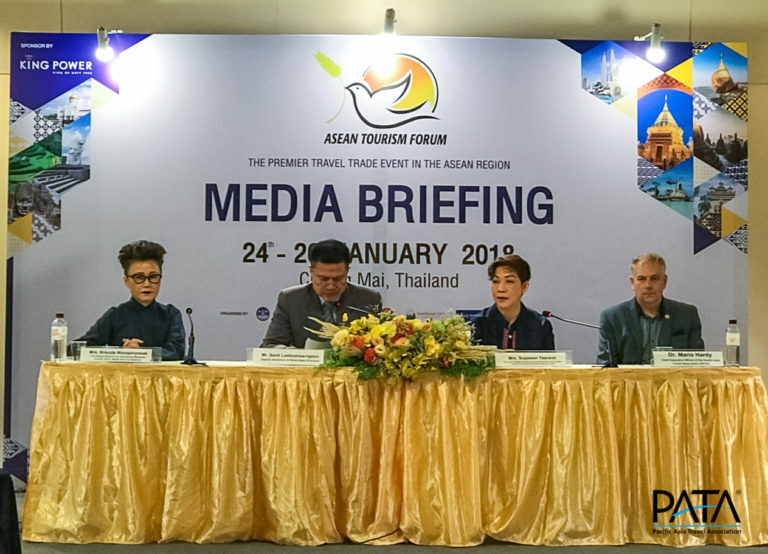 The announcement was made today (January 26, 2018) at a press conference during the ASEAN Tourism Forum in Chiang Mai, Thailand at the Chiang Mai International Exhibition and Convention Centre. The announcement was made by Mr. Santi Laoboonsa-ngiem, Vice Governor, Khon Kaen Province, Thailand; Mrs. Supawan Teerarat, Senior Vice President – Strategic Business Development & Innovation of TCEB; Mrs. Srisuda Wanapinyosak, Deputy Governor for International Marketing (Europe, Africa, Middle East and Americas), TAT, and Dr. Mario Hardy, CEO, PATA. “This event offers an important platform for all MICE stakeholders, including private sector companies, MICE operators and tourism businesses across the Asia-Pacific region. In particular the event will maximize benefits to Thai participants both from Khon Kaen itself, and from secondary MICE cities around the country. In order to further stimulate Thai participation, TCEB has negotiated waivers of registration fees for Thai operators and relevant government agencies for the event. The event will contribute greatly to raising visibility and awareness of Khon Kaen and other regional MICE cities as international MICE destinations. At TCEB we are committed to supporting responsible, low-impact, sustainable growth in the MICE business, to harness MICE events to benefit local communities, and to drive inclusive economic growth across the country,” she added. In advocating sustainable tourism and emerging destinations, PATA is pleased to offer complimentary registration to all interested parties who wish to attend. For more information about the event, please visit www.pata.org/pdmf or email events@PATA.org. Founded in 1951, PATA is a not-for-profit membership association that acts a catalyst for the responsible development of travel and tourism to, from and within the Asia Pacific region. The Association provides aligned advocacy, insightful research and innovative events to its member organisations, comprising 95 government, state and city tourism bodies, 25 international airlines and airports, 108 hospitality organisations, 72 educational institutions, and hundreds of travel industry companies in Asia Pacific and beyond. Thousands of travel professionals belong to the 36 local PATA chapters worldwide. The chapters organise travel industry training and business development events. Their grassroots activism underpins PATA’s membership in Uniting Travel, a coalition of the world’s major Travel & Tourism organisations dedicated to ensuring that the sector speaks with one voice and acts in unison on the major issues and includes ACI, CLIA, IATA, ICAO, WEF, UNWTO and the WTTC. The PATAmPOWER platform delivers unrivalled data, forecasts and insights from the PATA Strategic Intelligence Centre to members’ desktops and mobile devices anywhere in the world. PATA’s Head Office has been in Bangkok since 1998. The Association also has official offices or representation in Beijing, Sydney and London. Visit www.PATA.org. This entry was posted in Business, Festivals and Events, Tourism, Travel, Travel Management, Travelers and tagged Destination Marketing Forum 2018 (PDMF 2018), Dr. Mario Hardy, Khon Kaen, Mrs. Srisuda Wanapinyosak, Mrs. Supawan Teerarat, PATA, Santi Laoboonsa-ngiem, thailand. Bookmark the permalink.